I know it's been a while since i posted....we have been trying to settle into our new routine of school, getting back from Atlanta market, sickness, and just plain old responsibilities. Today I decided to get my camera out and take some pictures of some of our new TOYS!!!! The new rings we got in , I have to say were my inspiration and they are moving out the door at a very fast pace! If you like the square toe cowboy boots, these are Justin size 71/2 and very comfortable with hand pegged bottoms. I have these in my closet in a size 9 and they are one of my very favorites. We just got them in on Friday and they are waiting to be tried on and taken home! Great boots, slightly to big for me. Drats. But the ring. Are there differnt designs? I am going to have to come in and take a look. GEt paid first of the month, will be in soon! That ring is soooo cool...love it!!! OH!! 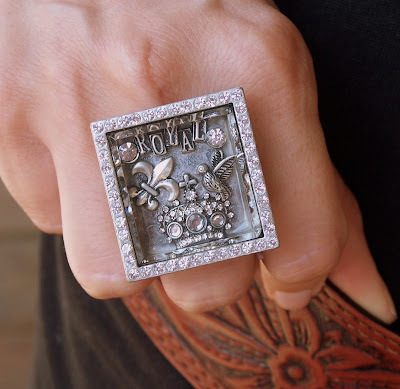 I adore Fleur dis Lis I MUST have that ring! gorgeous!! 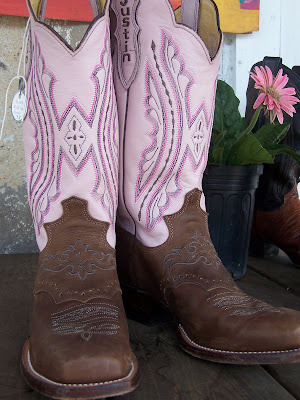 Oh these boots are beautiful!! Hey DeAnna, the boots are $175.oo, they retail for around $350.00, they are the Justin Punchy design, you should be able to google them. Looking forward to seeing you! Well, I just googled them and found them for 235.oo somewhere else, I guess it's where you look. The pair we have in stock are like brand new! how much are the rings? i love it! i need to come over there, but man i never have the time!!!! The ring pictured is 24.99!! !